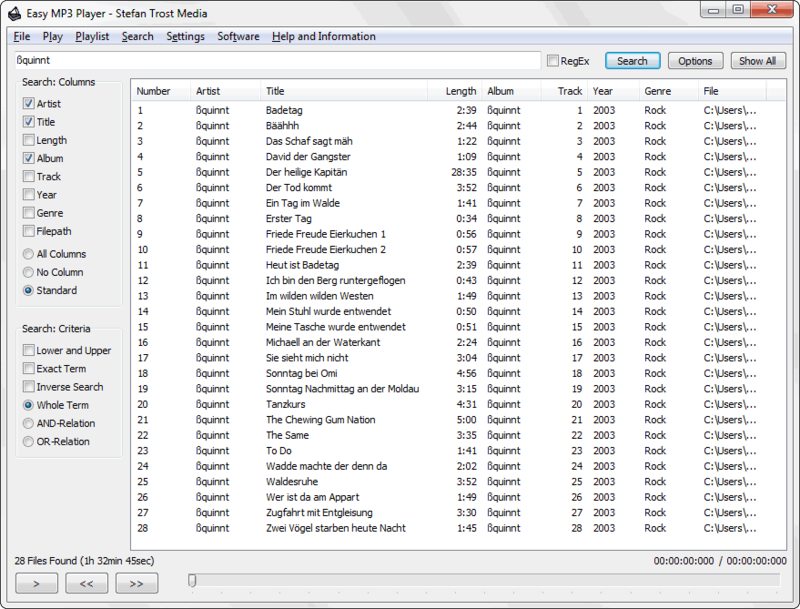 On this page you can see several screenshots of the EasyMusicPlayer. The screenshots are available for the operating systems Windows 7 and Windows XP. You can switch the shown operating system with the links under the screenshots. In the middle of the window there is a list of the songs loaded currently. To add songs to this list, you can open a playlist (*.emp), you can search folders for songs via the menu "Playlist" > "Add Folders" or you can simply drag and drop files onto the program. By double-clicking a list item, you can play the corresponding song. If you would like to switch between the display of the playing time and the loaded files to the display of the current song, you can click with your mouse on the text under the list. Other functions are located in the menu bar and if you use the right mouse button on a list item. All of these functions are explained in the sections help and functions. Press "CTRL + F" or go to the menu "Search" > "Search" to show the search functions on the top of the window. Here you can search for terms in your music collection, the fitting audios will be displayed in the list below after clicking on "Search" or pressing the Enter key. Behind the search box, you can select the option "RegEx". With this option, it is possible to carry out music searches with regular expressions. In addition, there are some search options. Click on "Options" on the search panel to show the options’ panel on the left of the window. On this panel it is possible to adjust, which columns are searched, if upper and lower case words are differed or if the search is concentrated on the whole term or single words. With the "inverse search" it is possible to reverse your query, so that only hits are displayed which do not agree with the word you have searched for. The distinction between "whole term", "AND-Search" and "OR-Search" makes it possible to search for "Word1 Word2" as a whole word, to display all hits that includes both "Word1" and "Word2" at a arbitrary position or to display all hits that includes either "Word1" or "Word2". If, for example, four different artists seperated with spaces are written in the search filed and you choose the "OR-Relation", all songs from all four artists are displayed. An easy way to use the search function is to right click on a song in the list. With this you are able to show for example more songs from this artist, this genre or this folder. This feature applies not only to the list but also to the current song. For this you can click on the title display under the list. Sometimes it is necessary to create a list of all of your music files. 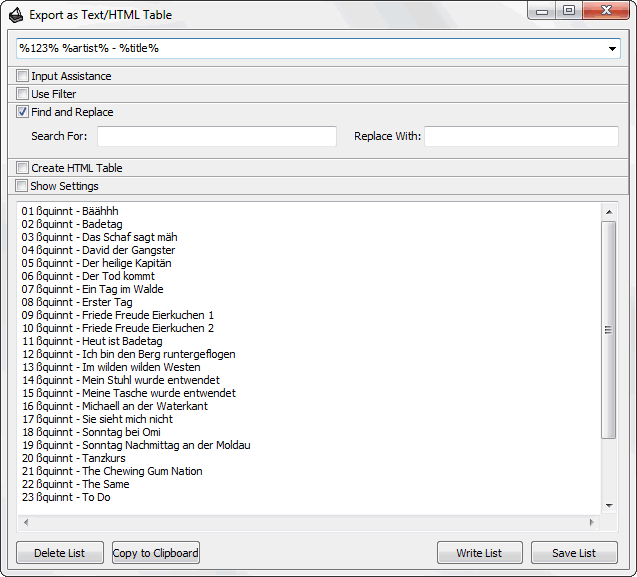 You can find the corresponding function in the menu "File" > "Export as Text/HTML-Table". The window is devided into three areas. The format of your strings you can define in the first input box, above you can see registers with the functions and the list. In this example, the format "%123% %artist% - %title%" was chosen. By this, a numbered list of artist and title is written. The single format elements like %album% or %filepath% can be inserted by the "Input Assistance" automatically, in addition it is possible to use every other character between the formats. For instance, with the other functions you can write a HTML table instead of a text list, replace some characters (Find and Replace) or allow only certain parts of your collection (Use Filter), for example the songs by a certain artist or found in a certain folder. The list is updated automatically, however, these and other attitudes can be adapted also under "Show Settings". 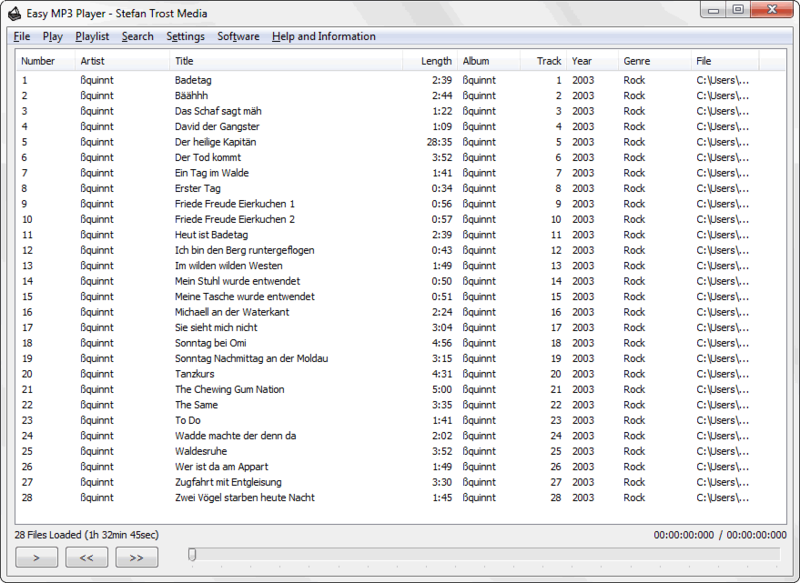 Tip: The Filelist Creator provides more extensive functions for creating file lists, including audio tags.